It feels like I’m always rushing from one deadline to another. 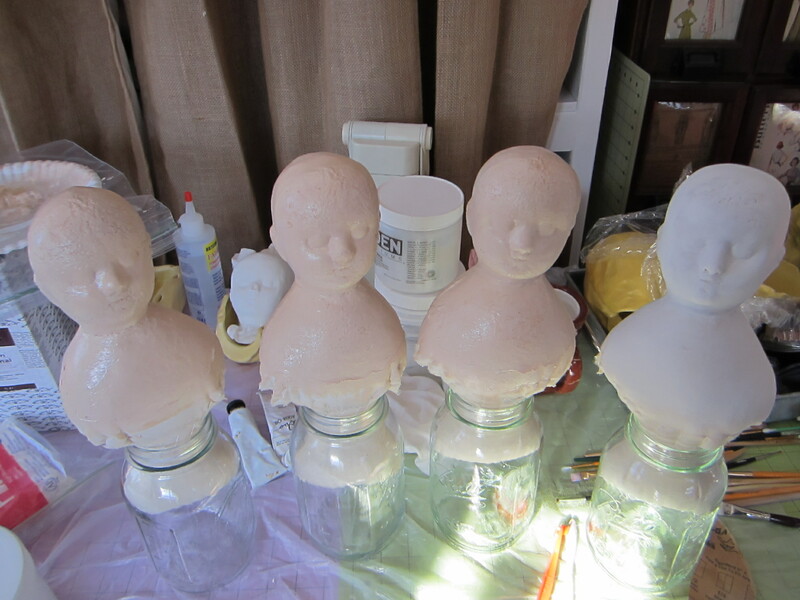 I’ve spent the past few weeks working on several new dolls for a photo deadline. I finished this doll today, just in time to rush her photographs down to the post office before they closed, getting them post marked on the very last possible day! 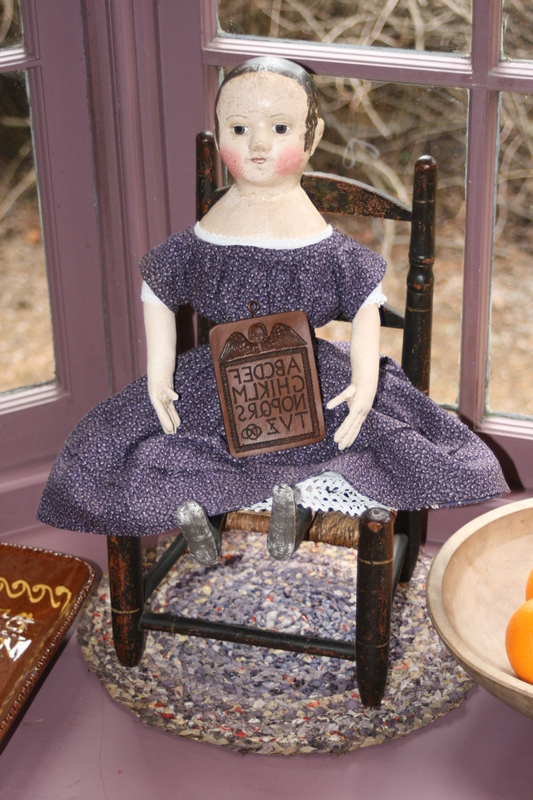 Actually this doll is one I had been planning to have finished before Early American Life came to our house in December. For some reason people always have the mistaken idea that I have shelves full of dolls, spun cotton ornaments and all of the other things that I make to sell. They imagine that coming here is like going to a secret hidden shop full of treasures, set inside the perfect 18th century New England farmstead… This is so far from reality ! 🙂 I normally don’t have any dolls here at all, unless there are one or two on lay-away. In real life most of my dolls get packed up and shipped just as soon as I get the last stitches finished. 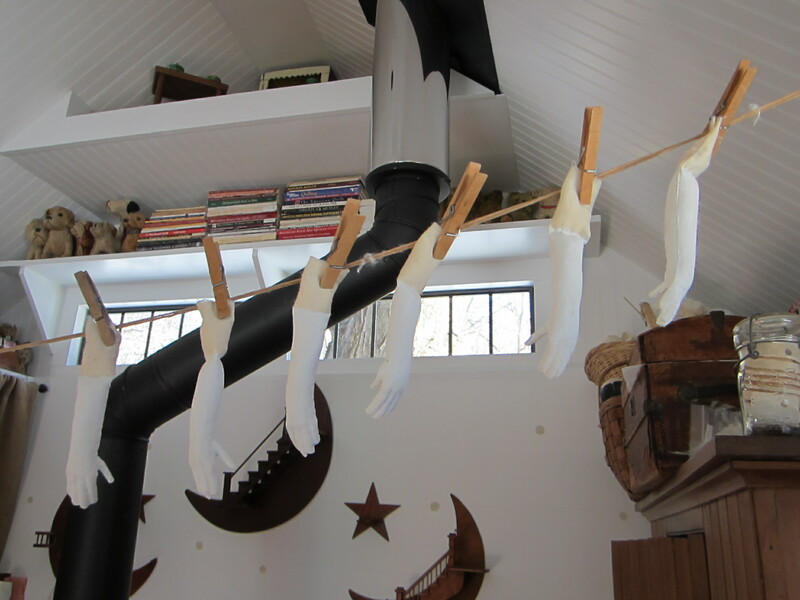 Plus doll making is messy, so my studio rarely looks tidy and there is a trail of thread and fabric snippits leading from the studio, across the yard, to the house, and into the parlor, where I sit in the evenings to do hand sewing. So part of my grand plan, when Early American Life asked if they could come photograph our house at Christmas, was to create three or four new dolls and a whole tree full of ornaments. None of them actually got finished 🙂 . By the time the retreat was over and I kept up with orders, then cleaned and painted throughout the house like a mad woman, there was no time left! So I postponed making this doll until my latest deadline instead. Now that she is finished, she will be keeping me company in my kitchen. I created her for myself, incorporating all of my favorite Izannah details. I even added a third ringlet in front of each ear, like the ones on the lovely antique Izannah that was just up for sale on eBay last week. I doubt that I will ever be able to afford the $22,000.00 opening bid on the eBay doll, but I decided that I can treat myself to one of my own dolls. 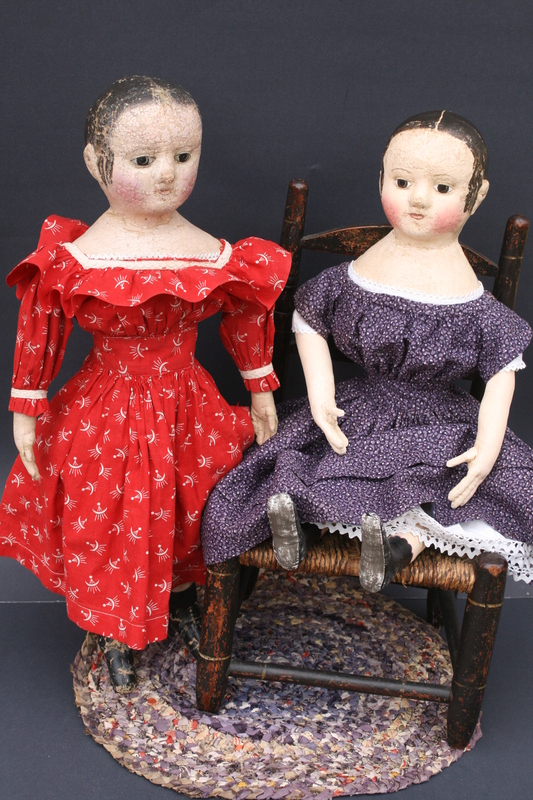 My c. 1860 antique Izannah Walker doll in red, on the left, and her newly made offspring c. 2013 dressed in dress made of rare “double violet” mid-19th century fabric, on the right. A steadfast new friend to share in my kitchen adventures! If you should ever be in need of a companion to share in your doll adventures, I would be pleased to make you an Izannah of your very own. Call 860-355-5709 or email paula@asweetremembrance.com to discuss all the details of a custom made reproduction Izannah Walker doll. * Did you notice the waived braid trim on her chemise and petticoat??? Read more about waved braid here. Previous Post Make History in 2013! Next Post Antique Doll Collector magazine has done it again! Breathtaking Izannah on February Cover! Oh Paula – you have created yet another beautiful Izannah Walker doll! She is simply stunning and I LOVE the double-violet fabric of her dress! She is so perfect for your kitchen! Just saw your new girl, she is darling. I also, love the double purple too. Are you going to do a pinne for her so she won’t get her dress dirty because she’s in the kitchen. Or is she a very neet young lady and doesn’t make a mess when she’s cooking. She will be getting an apron of some kind 🙂 I didn’t have any fabric that went well with the double violet, so she’ll have to be neat and tidy for the moment! Paula, I’d like to ask you is the chair that your doll is sitting on is it a dolls chair or sm. childs chair? Also, did you make the braided rug that the chair sits on? The chair is a doll’s chair and both the chair and the “rug” (which is really a table mat) are antiques. The “rug” is hand braided silk.